Today I want to share something interesting I noted about a couple of important dates in the tonalpohualli, the 260 day sacred calendar of traditional Mesoamerica (as opposed to the 360 day + 5 “dead days” civil calendar, used by the authorities much like the modern 12 month European calendar). According to the Aztec Calendar website, today is the day Nahui Ollin, or Four Movement. It’s a particularly special day because its the name day of Tonatiuh, the Sun of the Fifth Era — i.e., the present cosmic age. Now, this little detail is interesting enough in its own right, but I’d like to call your attention to one last thread of the story that makes it even more fascinating. The date Nahui Ollin isn’t only the birth name of Tonatiuh, the present Sun, but it is also the prophecied date that He and the earthly realm will collapse into chaos and darkness again. Thus, this single date and phrase is both His birth and His death, packed into one incredibly concise little packet bursting with meaning. Life and death, creation and uncreation, Mictlan and Topan, separated only by time. 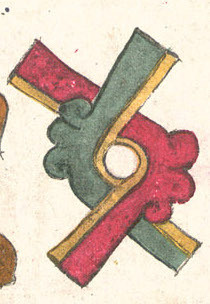 The Aztec alpha and omega. Sahagún, Bernardino , Arthur J. O. Anderson, and Charles E. Dibble. General History of the Things of New Spain: Florentine Codex. Santa Fe, N.M: School of American Research, 1950-1982, Book VI, pp.197-199, 201-207.